I swear if I lived on my own, soup would become a daily staple. It's the ultimate fast food for when you come in late from work, it's cheap, versatile, ideal when you only have a few ingredients left and when you need warming up. Total comfort food - it's the first thing people reach for when they want to feel better and you can feel self-righteous when anyone starts preaching about getting your 5-a-day. I love soup. I really love it. I don't think I'm the only one either. You could work your way around the world in soup. Gumbo, gazpacho, miso, borscht, callaloo, consommé, goulash, chowder, cullen skink and my beloved minestrone. Everyone loves it. I mean, the Jewish community are synonymous with their chicken soup. Textured, clear, chunky or chilled and garnished with a thousand possibilities. Aside from a few basics like sautéing the vegetables before adding liquid and using a good stock (preferably home-made) or a quality bouillon on the fly, the world is your oyster. The most interesting (and expensive!) soup I had was chilled broad bean affair with a zingy pea sorbet, dressed with pea shoots at The Tower restaurant in Edinburgh. This was my first ever cold soup and boy did it change my mind that a soup had to be a winter warmer. Its versatility can span the seasons. The ones I make at home tend to be a bit more "rustic". My favorites at the moment are a smoked pork loin, borlotti bean and cabbage, spicy mixed vegetable minestrone or a Moroccan influenced root vegetable mix. But my number one has to be this easiest-ever broccoli soup. I started making this as it was a way to use up a broccoli that was beginning to go yellow. Now I don't bother waiting! Whole broccoli, water and bullion or home-made stock, seasoning. Sweat off a chopped onion in some olive oil and when soft add a whole broccoli, cut into individual florets and chop up the stalk - don't waste anything. Pour in enough boiling stock to almost cover the broccoli and add a good pinch of salt. Cook until the broccoli is tender. Strain more than half of the liquid into a jug and reserve. Using a stick blender or food processor, blitz the broccoli and remaining liquid. Add enough of the reserved liquid to get the correct consistency - neither thick nor thin. Return the soup to the hob and check seasoning. 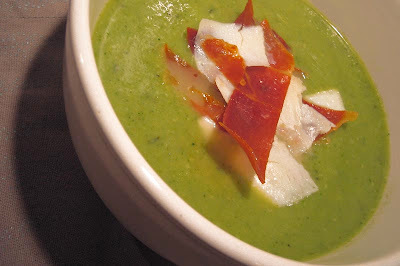 I like to serve this soup with tiny cubes of spicy chorizo, dry fried to remove excess fat and to crisp up before draining on kitchen paper or with pan fried prosciutto crisps and parmesan shavings.